Bill Warner, a speed racer and tropical fish seller from Wimauma, Fla., was attempting to hit 300 miles per hour within one mile on Sunday just before 10 a.m. during The Maine Event, an annual speed trial race sanctioned by the Loring Timing Association. Warner made it about 4,000 feet before losing control of his bike and crashing. LIMESTONE, Maine — Directors who helped put on a speed trial event at the former Loring Air Force Base where world record-holding motorcyclist Bill Warner was killed on Sunday said that he had the highest regard for safety and took excellent care of his motorcycles. William “Bill” Warner, 44, a speed racer and tropical fish grower from Wimauma, Fla., died while taking part in The Maine Event, an annual speed trial race sanctioned by the Loring Timing Association. He was attempting to hit 300 mph within 1 mile just before 10 a.m. Sunday when he lost control of his modified turbocharged Suzuki Hayabusa motorcycle and reportedly slid 1,000 feet. Limestone Police Chief Stacey Mahan said Warner went off the track and into the grass, where he and his bike went into a long slide. He was taken immediately to Cary Medical Center in Caribou, according to race officials, and was pronounced dead at 11:15 a.m. After the crash, the remainder of Sunday’s races were canceled. 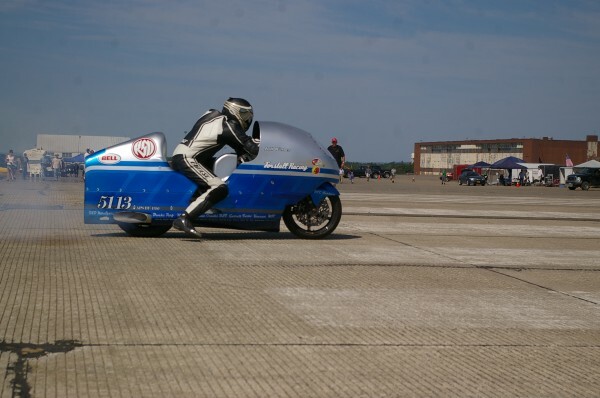 On Saturday, Warner broke the 1-mile record at Loring when he hit 296 mph. The Limestone Police Department is investigating the accident. The Maine Event brings together motorsports enthusiasts from around the globe for the pursuit of speed, according to the LTA’s website. The website also said that the track at Loring is the longest land speed record track in the world, with a total length of 2⅝ miles, including a long stretch for cooldown. Joe Daly is the motorcycle technical director for the LTA. He was present at the event over the weekend to help those who asked about motorcycle rules or technical questions. The Long Island, N.Y., resident said Monday that the LTA first began holding such events back in 2009. “They have always been well-attended by both participants and crowds,” he said. He said that organizers are vigilant about enforcing safety requirements and measures and keeping safety at the forefront. He met Warner, he said, who set a world record at the time trial in 2011, when he became the first conventional motorcyclist in history to top 300 mph, according to the LTA. On a 1½-mile course, he maxed out at 311.945 mph. That sentiment was echoed by Steve Van Blarcom, a Wallingford, Conn., resident who served as the car technical director for the event. He was present at the event over the weekend to help those who asked about car rules or technical questions and headed up the team that inspected cars to make sure they were qualified to take part in the event. Van Blarcom said that he started participating in the event in 2010. He also said that he believed that the LTA “strived to do the utmost to meet or exceed safety measures” during its events. He also knew Warner. Van Blarcom said that people who take part in speed trials know the risks involved. Calls to event director Mark Sotomayor and race director Tim Kelly were not returned Monday. The Limestone Police Department also did not return calls for comment.